Give A 360 Cleaning a call for all your commercial cleaning needs! Do you want to ensure the cleanliness of your commercial space? One of the best steps for doing so is to invest in a commercial cleaner! A trusted commercial cleaner like a360 cleaning will help to keep your commercial space looking great all year long. We have compiled a list of a few reasons why you should bring in a commercial cleaner this year. Continue reading, and you may realize why commercial cleaning services are a wise investment for you! It is nice to have peace of mind that you have a commercial cleaner in your corner. If you want to ensure that your commercial space remains clean, a commercial cleaner is usually your best bet. They have the knowledge and equipment needed to maintain your commercial space throughout the year. Try to remember to achieve a professional appearance, and you need to keep it clean! When you have customers and guests enter your commercial space, they will notice if the cleanliness is not up to par. In other words, it will reflect poorly on your business if it is not cleaned regularly. It is important for you and your employees to be working in a clean environment. Since you likely spend several hours a day there, you want to be sure that your office or facility remains clean and healthy. Otherwise, you are putting your employees at risk of becoming sick. Try to think of hiring a commercial cleaner as an investment. In a way, it virtually pays for itself over the years because it should save you a lot of time. 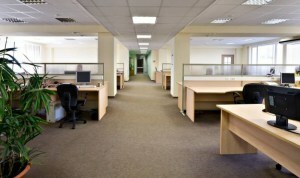 A commercial cleaner will come through and ensure that everything is cleaned and maintained. A 360 Cleaning has provided Maryland with top-notch professional cleaning and janitorial services for over 12 years. We don’t cut corners and ensure that every customer is satisfied with their cleaning. Whether you need a glitter spill cleaned up or an entire office building, we are happy to help! We currently serve the following areas: Baltimore, Annapolis, Glen Burnie, Severna Park. To explore how we can help keep your windows clean all year long, give us a call at 410-852-5800 or visit us online. For more cleaning tips, follow us on Facebook, Pinterest, Twitter, Google+, and LinkedIn. This entry was posted on Friday, March 22nd, 2019	at 9:48 am	and is filed under Commercial Cleaning	. You can follow any responses to this entry through the RSS 2.0	feed. Both comments and pings are currently closed. Are Dirty Floors Actually Harming Your Business? © 2019 A 360 Cleaning. All Rights Reserved.